"I suppose I should be grateful for offering to make an honest girl of me. But I'm not grateful. I'm just disgusted." Naïveté and innocence were Doris Day's stock in trade for much of her career, and she puts them to excellent use in this 1951 musical romantic comedy. That naïveté and innocence are contrasted with the worldliness and sleaze of the realm of Broadway in a memorable way, and an A-list of tunes and a superb roster of supporting character actors make this a absolute favorite. Singer/actress Melinda Howard (Day) is returning via ship to New York from England to visit her mother, Jessica Howard (Gladys George), whom she believes to be a star on Broadway. But drink and dissipation have taken their toll on mom, who has been reduced to singing in clip joints in between sessions of drying out. Lefty Mack (Billy De Wolfe), a friend of Jessica's, helps to conspire to hide the truth from Melinda. Lefty, an actor between shows, is currently working as a butler for brewer Adolph Hubbell (S.Z. Sakall), and pretends that Hubbell's house is actually Jessica's home, rented out to Hubbell while she's out on tour. Hubbell plays along, but he begins to be romantically interested in Melinda himself, despite the suspicions of his battleaxe wife, Anna (Florence Bates). Things come to a head when Melinda is cast in a show that Hubbell is funding and Anna files for divorce. Day is as usual engaging, with tons of charm and a wide range, especially in her reactions after the newspapers get wind of the possible scandal in her situation. The juxtaposition of her wounded pride and trusting character against the crowd of reporters ready to believe the worst is very effective. Her singing is typically dazzling and seemingly effortless. She also more than holds her own tapdancing with co-star Gene Nelson, her romantic interest. He's fairly dull and uninteresting (when he's not being slightly creepy), but otherwise the supporting cast is terrific. Sakall had appeared with Day before in Romance on the High Seas (1948), and his befuddled German character is a fun combination of cluelessness and deviousness. The always-entertaining Billy De Wolfe doesn't disappoint here, with the perfect combination of smarminess and heart-felt affection. Gladys George's pathetic turn as Jessica, full of both pride and shame at once, is quite memorable and affords another effective contrast to Day's character. Florence Bates (Rebecca) turns in another fine performance in a fairly limited role. The setting of show business affords the opportunity to have the songs naturally fit into the story for the most part without feeling too forced. They're generally classics, with the title tune in particular a highlight: during the finale the song opens with a spot solely on Day's face, giving her an eerie disembodied appearance before evolving into a full production number. Another highlight is a tap number with Nelson that involves using swinging glass doors as a prop. The one song that doesn't seem to fit is Cole Porter's Just One of Those Things, with its rather casual attitude to romance. It isn't entirely convincing when performed by Day, who can't quite summon the necessary venom for the subtext of the tune. But that's a pretty small failing in an otherwise very enjoyable musical. Image Transfer Review: The original full-frame Technicolor picture looks terrific. There's plenty of sharpness and detail, without significant edge enhancement. Colors are rather subdued, giving the film a picture-postcard appearance. On occasion skin tones are a wee bit unstable, but black levels are excellent and the source print exhibits hardly any wear or damage. There's really little to complain about. though De Wolfe's patterned vest in one scene is a startling mess of moiré patterns in an otherwise clean transfer. Audio Transfer Review: The 1.0 mono English track sounds fine, with a decent range for the period, without shrillness or significant hiss or noise. Bass isn't any worse than one would expect for a film of this vintage, and the vocals on the songs sound excellent, with the timbres of Day's voice coming through marvelously. On the title song she literally induces shivers and that feeling comes across very well indeed. Extras Review: The sole extra is a set of trailers from Day musicals from Warner Bros. spanning the period 1948-1954, most of which have yet to make it to DVD. Hopefully a second boxset will remedy these omissions. Oddly enough, the dual-layer disc has the movie entirely on one layer and only the trailers on the second one. This seems like an odd mastering decision, but since artifacting is minimal there seems to be no harm done. 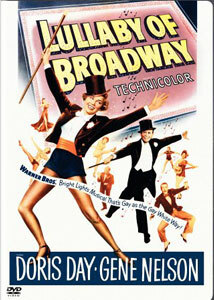 A very entertaining musical, with a great supporting cast and some topnotch songs, and a first-rate transfer. No significant extras, however.